How Easy Would It Be to Communicate with Musical ETs - as in "Close Encounters Of A Third Kind"? This is an interesting question I was asked recently on the space show. It's inspired by this 5 note theme from the 1970s movie. (if you don't see videos in this page, try reloading it). It's the theme tune from Close Encounters of the Third Kind (composed by John Williams), of course, the music the extraterrestrials use to communicate with humans in the movie. Is that just a rather fun movie idea? Or was the director Spielberg on to something, might we be able to communicate with ETs perhaps more readily in music than in other ways? You can hear the question itself here, in the podcast: "Humans to Mars and other destinations in the solar system - with Robert Walker". It's about 53 minutes into the talk, a question via email, by Alan in Phoenix Arizona. I gave a preliminary short answer on the show, but to answer it at all adequately would have taken a whole space show to itself :). "Mathematics is a way of communicating with another species from off the planet - but mathematics is also music. Wouldn't it be great if the maths was musical maths, and they started to communicate with each other through lights, colours, and musical tones", (Stephen Spielberg interview about the movie, 4 minutes in ). Might that be the way it actually happens, if or when we make first contact with ETs for real? In this article, I'm going to start by looking at various things that might make this musical communication tricky - and then we can start to see if these difficulties can be overcome, so that perhaps musical communication might work after all. First of all obviously it's going to depend on the ET. Many human beings don't appreciate human music; either they just don't like it, can't hear it too clearly, or maybe are profoundly deaf. More interestingly, the way ETs experience sound may be very different from the way we experience sound. As a simple example, they might experience sound the way bats do, as a form of echo-location. In that case their music might be extremely difficult for us to understand unless it is translated into something we can understand, such as some kind of landscape, 3D shapes or whatever. What if the ETs use sound for eco-location? Blind people of course also use a similar method to feel the positions of things in their surroundings when they tap their cane on the ground. Famously though, David Kish also uses bat like echo location to "see" the world, and is able to cycle and walk on mountain trails by himself in this way, and here he describes what it feels like. This may give some idea of what echo-location may feel like for a bat type ET (since bats can't tell us what it feels like to them). His echo location doesn't just give him the positions of the objects around him, it also lets him tell the differences in texture and density. For instance he can hear a difference between a metal and a wooden fence. See Human echo location: using tongue clicks to navigate the world, for more about it. Bats similarly can tell differences of texture by echo location. Most of us haven't learnt to echo-locate like this; or even to use a blind person's white cane, but we do have some spatial experience of sounds all the same. You can try this out for yourself. Get someone else to clap (with your eyes shut) and try to point in the direction of the clap. You might be surprised at how accurately you can pinpoint exactly where the sound came from. Also, try this binaural recording of a "Virtual Barber's Shop" - warning, it can be a bit scarily realistic at times. You have to listen to it with headphones or earphones to appreciate it, and its best if you use the closed type headphones. Or, for a gentler example, this immersive natural 3D audio scene, again to appreciate it you have to listen to it with headphones. Try also this binaural recording of Leicester market and other binaural examples in Wikimedia commons. So, this maybe gives us some idea of what it might be like to perceive sound three dimensionally, like a bat. We are especially good at horizontal spatial resolution. We also have a certain amount of resolution vertically. And we have a surprising amount of audio depth perception as well especially for nearby sounds. It's partly due to the reflection of sound off our shoulders, and the shapes of our ears. And also there are other cues such as reverberation and the way sound bounces off objects in our environment, and this helps to give us a sense of depth as well. Also of course, sounds getting quieter as they get further away, as well. See this summary of some of the main 3D audio cues for sound synthesis. So, it's surprising how fine our spatial perception of sound is, and we respond to this, but are not much aware of it in our daily life. Also, it is rare for it to be used in a significant way as an essential part of music. We make some use of this course, for instance the way the instruments are spread out in an orchestra, it feels more immersive if you've got this three dimensional component to it, and play the recording in stereo or a binaural recording. But you can appreciate music fine when you listen to it in mono. What if the ETs experience light like sound, and sound like light? This difference in the way we appreciate sound and light suggests the question, what if ETs experienced light the way we experience sound, and experienced sound, the way we experience light? This question can help to bring out how unusual it is, the way we experience sound, and perhaps suggests ways in which the experience of sound for an ET could vary from ours. When we listen to sound in mono, what we hear is not even one dimensional, it is zero dimensional, like a single point. The equivalent in vision would be to reduce an entire painting to a torch shining a single colour - and for an entire movie, have a torch shining continuously with changes of colour, from time to time. You would lose most of the essence of the movie if you did that. While if you reduce a movie sound track to mono you don't lose that much, and you can certainly still follow and understand the movie. We can get an idea of what its vision would be like for an ET that sees colour the way we perceive sound from these movie barcodes where an entire movie is compressed into a bar code - except, each moment in the movie would be just a single point of colour, not even a vertical line of varying colour. You can make your own movie barcodes using the Movie Barcodes Generator. Here is the movie barcode for my first video in the series on "Ten reasons not to live on Mars, great place to explore"
That's like our stereo recordings of music, because you have variation in colour vertically. If ETs experienced light similarly to the way we experience sound, then when they watch some event together with us, they might record it using a similar movie barcodes (played in time, like a movie on a screen), These stereo and mono movie barcodes might seem to them a perfectly adequate reproduction, just like our stereo and mono recordings of music. That is - except, they would record the colours in much more detail than we do, and these pure colours would be to them a much richer more immersive experience than it is for us of course, as rich as monophonic music is for us. Where we see just a single colour and can't analyse it at all, if they experienced light the way we experience sound, they would see a mix of many different colours and experience the way those frequencies change and effects similar to polyphony, counterpoint etc, all in what to us seems to be just a single colour occasionally changing in hue or saturation or brightness. Let's look more closely at how our perception of sound and light differs - what is it about our physiology that makes such a difference? Before we get to this, it's worth mentioning that sound and light are different things physically. Light is actually an oscillation between magnetism and electricity able to propagate in a vacuum through empty space. Magnetism transforms to electricity which then causes more magnetism which then causes electricity in an endless cycle. That is why you can pick up radio waves with an antenna through the electrical effects on the metal of the antenna. It can only travel at the speed of light, and has "zero rest mass" so theoretically if you could slow light to slower than the speed of light, it would have no energy and no mass. Sound is the result of vibrations passing through the air - or indeed through wood and other materials. Since these materials have non zero rest mass, sound always travels slower than the speed of light, speed depending on the medium. In our atmosphere, sound travels at about a millionth of the speed of light. It can pass through space as well, so it's not totally true what some say, that there is no sound at all in space - that's because space is not a complete vacuum. The highest frequency of sound that can travel through a medium depends on its density. Even between the planets, even between stars and between galaxies there are a few atoms, and ultra low frequency sound can travel through it, with huge wavelengths of thousands of kilometers or more - but these are far below human hearing and surely far below almost any ET hearing too. Indeed, the spiral waves in galaxies are formed partly because of extremely large wavelength slow moving sound waves spanning the entire galaxy. These are also extraordinarily hard to detect directly as sound, and of course travel far more slowly than light. So, there is this difference, that we are only likely to communicate with ETs via sound if they translate the sound into radio waves or laser light first and we translate it back again to sound - or unless they are able to actually visit us, or us them, as in Close Encounters. But there is nothing intrinsic to the nature of sound about the way we perceive it. Both sound and light are wave phenomena. Light is a wave in the electromagnetic field and sound is a wave in air or other materials made up of atoms. With both you can have many frequencies played simultaneously. With both also, there is a possibility for extremely high spatial resolution. Both can be focused too, you get acoustic mirrors and acoustic lenses. Indeed liquid filled acoustic lenses are used by submersibles for detailed imaging underwater using sonar. (Acoustic lenses thesis, example of acoustic lenses used by submersible, and example hand held sonar device with acoustic lens for divers). The organs we use to detect light can't detect sound, and vice versa. But as both are wave phenomena, there is no intrinsic reason why they have to be perceived in different ways from each other. In the case of sound, we have numerous tiny hairs in the cochlea, a spiral structure in our inner ears that respond to different frequencies. With these, we can hear lots of different frequencies simultaneously, and pick them all out and pick out the intensity of every single frequency. And you can hear relationships between these frequencies of octaves and fifths and things like that. For light, we have numerous receptors again, in our retina at the back of our eyes -so that is similar so far - but they are all tuned to just a few different colours. Then we have another special cell sensitive to low light levels that senses only black and white. So most human beings have receptors in our eyes for black and white, and three colours. Some of us of course, if colour blind, have less, and rarely, we may have four colour receptors (some of us have two types of red receptor and so can distinguish more shades of colour than others, especially shades of red). When we represent colours on the computer screen we have high spatial resolution but individual pixels use just three colours to build everything, red green and blue. It's red green and blue, rather than red, yellow and blue, because the way light mixes is different from the way paint mixes. Just using different intensities of red green and blue you get all the colours on the computer screen. For us humans, a normal yellow such as you see on the computer screen is completely indistinguishable from a mixture of red and green light. Unless it is a very intense yellow, we simply can't tell if we are looking at a mixture of red and green light or at yellow light. This shows how light is represented on a computer screen. The three vertices of this colour triangle are the three pixel colours of our computer screens - red green and blue (according to the revised 1976 standard for the colours). All the other colours are created by mixing them in different proportions. So, for instance, an equal mixture of red and green gives yellow (half way between red and green in the picture). Techy note:, this is mixing of lights, which works differently from mixing of paints, and also, there have been many different suggestions for the primary colours of light, this is the 1976 standard used by most modern monitors, but there are other ways of defining them, indeed originally in the nineteenth century the first proposal was to use red, green and violet as the primaries. There is much room for discussion here because there is no light able to stimulate only one of our types of colour receptor - but it is probably going off topic to explain why just here. The main point is that for humans most colours can be made up by mixing red green and blue light as shown. For an ET with colour perception similar to our perception of sound, a mixture of red and green light wouldn't look yellow at all. That's like expecting a chord made up of the two notes C and G to sound like the note E to a human musician. Then the other way around, if ETs experienced sound in the same way that we experience light, then they wouldn't be able to tell the difference between the sound of a chord consisting of a mixture of (say), C and G, and the single note E. Both would sound exactly the same to them. Another difference between light and sound, is that in light we have no experience at all of octaves or fifths, or frequency relations between different colours. The range of visible light is almost exactly an octave (wavelength from 780 to 390 nm), and you might think there is a slight resemblance at the two extremes, that violet has a "reddish tinge" but that's because our red receptors have a different response curve from the other receptors, and happen to be more sensitive in the blue region than green receptors - it is nothing to do with perception of octaves in light frequencies, just a quirk in how we perceive colour. You do talk about harmonizing and clashing colours. The Fauves especially, rejoiced in bringing together opposing colours in their paintings to make them more vibrant. But the idea and theory behind it is very different. It is to do with the mixtures of the three primary lights. In our analogy of the ETs with their recording of all sound as mixtures of C, G and C', it's like them deciding that an equal mixture of C with G "clashes" with an equal mixture of C and C' - that would be like saying that yellow clashes with purple, which some artists say (others say that green clashes with purple, or in our analogy, G clashes with a mixture of C and C', differing ideas here). Also the notion of clashing and harmonizing colours is far more subjective in paint. In music, we all can hear beats, and whether you like them or don't, we can all agree that certain musical intervals give a sensation of strong beating, a wah wah type effect in our ears, and that others don't. And all musicians and in all cultures world wide musicians agree on octave equivalence, and can hear it to an astonishing level of precision, can agree on whether or not two notes are an octave apart, and can hear this to a tiny fraction of a Hertz in the range around middle C. There is nothing quite like that in light. Also there is nothing like melodic transposition in light, you can't take a sequence of colours, and then shift them all up in frequency in the visible light spectrum, say, shift the sequence red yellow green,, and shift it up to yellow, green, orange - and you wouldn't expect a human observer to notice any resemblance at all in the sequence of colours, never mind see it as so identical that if asked to reproduce it a day later, most musicians (unless with absolute pitch) would be as likely to create the one as the other. Might ETs experience light and sound like that? So far this is a rather fun idea, but could it actually happen? Might ETs actually be like that. Well no Earth creatures have followed this route as far as I know. But the ETs may have evolved in a different environment from the Earth, where it is important to be able to distinguish many different visual frequencies. Perhaps they might need to distinguish light in the same way that we distinguish sound, in our environment. Or it could just be that evolution took a different turn on the ET's home planet. Though some things like eyes and like the shape of a fish come up again and again on Earth ("convergent evolution"), we also have strong patterns that got established early, e.g. the pattern of four limbs for animals and six legs for insects. Also, we have some quite bizarre features of our anatomy which evolution has never "corrected". E.g. because our lungs are in front of our stomachs in our body but our mouths are below our noses,, then our food has to cross over the air passage, in our throats, causing the risk of choking. And our eyes are "back to front" - the blood vessels that supply blood to the receptors at the back of our eye actually are in between the receptors and the incoming light, so our retinas are connected "back to front". Presumably these arrangements are "good enough" and require so many tiny step by step changes to convert one to the other that over the millions of years of evolution, no animal has evolved that corrects them. So one should hesitate to say that our eyes are the "best possible" even for Earth. It seems at least possible that there might be possibilities for vision that evolution simply never explored on Earth and that ETs evolved in a different direction. We already have several different types of receptor in the eye, and some animals have more. Some birds, reptiles and fish are tetrachromats, with an extra colour receptor able to sense, usually, ultraviolet light. Indeed ETs mightn't have eyes either, their whole skeleton may be their eye as in this amazing brittle star that has no conventional eyes, but sees through calcite crystals and photoreceptors in its skeleton. "built into the skeletons of brittlestars -- animals similar to starfish, but much more mobile -- are arrays of near-perfect microscopic crystals that focus light. " - Seeing the Brittlestar in a New Light Perfect Microscopic Lenses Could Be Part of "All-Seeing Eye"
This again shows how evolution may not explore all possibilities. Though eyes are often held up as an example of convergent evolution, we only have one present day type of creature that uses its skeleton for vision rather than eyes. Yet for that one creature, it is clearly a highly successful adaptation. It may be an accident of evolution that we don't all see through our skeletons rather than through our eyes, or it might be that ETs evolve in an environment where this is a far more useful adaptation than eyes as for the brittle stars. So, though we don't have an example of this on Earth, if it was important to be highly sensitive to the different frequencies that make up light, their eyes might have lots of different receptors just as we do, but all tuned to slightly different colours. For an exact analogy with sound, they could leave out the lens in the eye, just have a diffuser to spread out the light. That way their "eyes" would have limited spatial resolution, but experience the different frequencies of the light in much more detail than we do. It certainly seems physiologically possible. As to whether it is probable or not, I've no idea how you could tell. As with all speculations about ETs we hare hampered because so far we have only one example, ourselves. But is fun to explore for sure. What would it be like in detail, for ETs to experience light like sound, and sound like light? All our photographs and movies would be like that, just various intensities of red, green and blue light. And for them the frequencies would matter much more than the spatial structure of the movies, if they saw vision the way that we hear sound. Our movies and photos would all seem very much the same to their eyes, and they might find it hard to see anything in them at all. If they looked at the original of Monet's haystacks, they would see more colours of course as he used paint rather than just red green and blue pixels, but still would be limited, they would notice the pigments he used, and it might not at all resemble the colours that we think are similar. The other way around, if they experienced sound in the same way that we experience light, then they might well decide to reduce everything to various intensities of three pitches, just as we reduce all colours to three colour frequencies in our computer monitors and movies. They would probably set standard pitches for them, just like the international standard RGB for computer monitors. This then would be thought adequate to represent all sound. For instance if they standardized on a single octave (similarly to our vision perception), then as we saw, they might decide that middle C, G, and the C' an octave above middle C are perfectly adequate to represent all sounds. So all their recordings of sounds, including e.g. if they made recordings of our music too, would consist of just those three notes, varying in intensity - and of course reproduced with ultra high spatial resolution. In this situation then surely their visual art and ours would be mutually incomprehensible and same for their soundscapes and our music.So that is one way in which their experience of sound might be different from ours. But if this happens, this is just a translation issue. If they experience light the same way we experience sound, you can translate one into the other. So they might be able to experience our music by translating it into, say, light, and we might be able to experience their vision, similarly, by translating it into music. This translation of vision into sound is something we do anyway BTW, for instance sometimes the engineers of radio telescopes will listen to the radio waves as sounds. You hear a lot more detail in the sounds like that. I don't know if it is put into practical use, but you get radio recordings translated into sound and it creates quite interesting sounds sometimes. You can hear things that way which you couldn't possibly see if it was translated into light. Here is a NASA recording of electromagnetic radiation from Jupiter translated into sound. Another way in which their experience of sound could differ from human sound is that it could be much higher pitched or lower pitched than ours. So, they might be like bats, the bat squeaks that some of us can hear are at the very lowest range for bats, and they make sounds that are far too high even for young children to be able to hear. Or they might be very low in frequency like the infrasound of elephants, which are thought to be a significant part of their communication, and they communicate with each other miles apart, through infrasound. Human beings simply can't hear it at all. Elephant rumbles in the jungle (BBC Worldwide) - transposed up into human hearing. So this is a translation thing again, we can transpose it up in frequency, and down in frequency again, and we could hopefully appreciate their music, if it is based on similar principles to ours. ETs with a radically different time sense from us - what can we learn from creatures on Earth? Then, another way it could differ is through the time sense, which of course is a fundamental part of music also, as important as pitch. This is something not much talked about, quite rare in science fiction stories. Nearly always the ETs in science fiction stories experience time very much as we do. They don't speak incredibly quickly, and they don't speak incredibly slowly. They move at much the same speed we do as well, and they don't walk around like tortoises, and they don't move around as quickly as birds to either. There are some notable exceptions, but by and large there isn't much treatment of differing time senses in sci. fi. If we look at other creatures on our Earth though, it's clear that there is a wide variety of time senses. Tortoises are an obvious example, they must experience life at a much slower pace than we do. For a tortoise-like ET, Lento, a very slow piece of human music, would surely sound extremely fast. Sloths are another type of creature noted for its slow pace of life. To this sloth, or to a tortoise, a "Lento" tempo, slow to humans, would seem very fast surely. Many ETs may have time senses similar to a sloth or slower; there seems no reason why they would have the same time sense as ourselves. What seems like a comfortable pace of music to us, seems very normal relaxed, steady kind of pace, Andante, based on human walking pace, or based on human heart beat, about once a second or thereabouts - and if you go just double that, it sounds very fast to us. If you do just half of that, it sounds very slow to us. And if you do three times, it sounds extremely fast. People who study the interactions of birds on bird tables need to slow it down with high speed cameras to see what is going on. They react to each other far more quickly than a human eye can follow. Here is a video of hummingbirds on a bird table, it perhaps gives an idea of what it seems like to the birds themselves, at any rate their time sense must be much faster than ours to respond so quickly to each other and with such precision. Their heart goes 1000 beats per minute, so maybe their time sense is about 10-15 times faster than ours? Bird song also has details at a much higher speed than for human songs. Here is a youtube video of the song of a hermit thrush slowed down first to half and then to a quarter speed. So, maybe the time sense of birds is about four times faster than humans, the way they experience the passage of time? While maybe for hummingbirds, it is more like tens time faster or more. But again, this is a translation, you can translate a fast time sense to a slower one and so on. There is some treatment of this in sci. fi. Perhaps the most notable is Robert Forward's "Dragon's Egg" neutron star story - where the ETs live on a neutron star and have a massively faster time sense - leading also to a greatly speeded up history too - in the few days of a human visit they advance from primitive technology, stimulated by the radar pulses from the spaceship to innovate, all the way to our level of technology and then well beyond it. Sometimes you get sci. fi stories about ETs with a massively slower time sense than ours too. This perhaps gives an idea of what it might be like to relate to an ET with a massively speeded up time sense - so they go through their entire childhood in a few minutes of our time, like the ETs of Robert Forward's novel. Another well known fiction story with speeded up time sense is Terry Pratchett's Nome's trilogy where the Nomes life far faster than humans, and are not sure if we are intelligent, with descriptions of humans turning their heads so slowly that the nomes are easily gone before they can be seen. There are many other science fiction stories with time distortion, often through machines and devices, but ETs with different time senses are rarer. See Time Distortion in the Encyclopedia of Science Fiction. It's harder to find stories of ETS with a natural slow time sense, but some examples are Eric Frank Russell's "The Waitabits", Roger Zelazny. "The Great Slow Kings", and perhaps Jack Sharkey's "The Twerlick" (all of these are short stories). I'm interested to hear about other examples of ETs with different time senses from ourselves in science fiction - do say in the comments if you know of any others. With humans anyway music relates to the pace of our heart beats and is to do with the rhythms of our lives. Rhythm is something that may be much more common than pitch. Certainly just about all of the creatures on Earth, they have some rhythms in their life, like day and night, except for very few situations like the deep hydrothermal vents where there are really no changes from day to night and almost no changes in the seasons - and in caves. But in almost all other situations, there is the passage of day and night. There are also the rhythms of your body of course, and the rhythms of the seasons, rhythms of the lunar months as well, many rhythms in our lives. It seems that many ETs also would have rhythms in their lives and they may have something that is a bit like music, so whatever else there is in their music, there might be some communication of rhythm, whether in sound, or light or whatever is their closest to our music. Another thing that is almost universal amongst animals on the Earth is a sense of touch. Even amongst microorganisms. Even things like snails, they have a hard shell, but inside is a soft sensitive body, and they have a sense of touch as well. And with a sense of touch, you also get a possibility of experience of pitch that way as well. For instance profoundly deaf musicians, Evelyn Glennie, the famous percussionist who is profoundly deaf - she experiences rhythms through her sense of touch - but she also has experience of pitch as well, so she can feel the pitches of notes through her hands and through her feet. Evelyn Glennie How to truly listen Ted Talks, talks about how she hears sounds through her body about 8 minutes in. (See also TED page for this video). Evelyn Glennie Hearing Essay on how she hears pitches through her sense of touch. So you can have some experience of pitch as well through a sense of touch. So touch being so universal, there may be a certain kind of universality to music there as well. Perhaps if they can't appreciate it as sound, they might be able to experience our music as touch, and the sense of rhythm may be very common. What if the ETs have no linear sense of time at all? In order to experience this sense of rhythm, you do need a time sense. It seems very likely that ETs would at least have very short term memory such as we have just for the last few seconds, so that they can react to things - but would they experience time beyond that the way that we do? If they live in an environment with many rhythms, and changes of day and night, you would think that locating things in time like that would be important, but we do have other aspects to our experience of time. There is also a non temporal way that we remember things from the distant past. So you might try to remember the name of someone you knew maybe 10 or 20 years ago, and you think, what was her name, was it Emma? Maybe it was Emily? Then a day or two later maybe you suddenly remember "Oh yes, she was called Amanda" - and you remember the name just like that and then you are absolutely sure at that point. But it is not like you go back in time and you remember a particular time, and eventually get back to however many decades ago it was, but it comes back, right in the present. There is no time sense, you don't know where that name comes from, in a way. So, we have this in our memory. For ETs, it is possible that this might be much stronger for them, than our linear sense of time. They might not have a very strong linear sense of time. It might be much more important to associate memories with places rather than with times, so when you go to a place you've been before, you immediately access all your memories of that place, or that type of place. It seems to me that this is most likely to happen if the ETs live in a very steady environment like hydrothermal vents, but there may be entire worlds that are like that. We actually have an example in our solar system. It is even not impossible, may be a bit far out but we certainly can't disprove the possibility, that there might be ETs living there. Here I'm talking about a possible place in our solar system where there could be ETs and they could be completely undetected by us, and us by them. 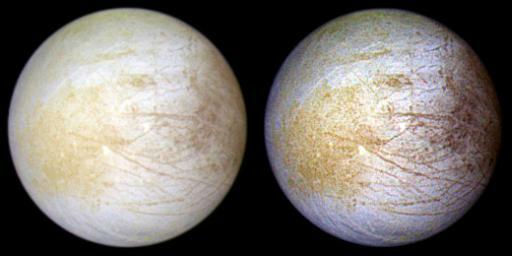 This of course is the icy moon of Europa, and it is thought to have subsurface oceans kept liquid by tidal effects of Jupiter and the other moons of Jupiter. This is the second innermost Moon of Jupiter, and the interesting thing is, that it's sea or seas are thought to be quite oxygen rich because the high ionizing radiation of Jupiter, hitting on the surface ice, apparently creates very significant amounts of oxygen, by dissociating the water, to such an extent that even over the very long timescales and geological processes, eventually being subducted into the ice, it should make the oceans beneath very oxygen rich. So there is the potential there for not just plant life but even animals like ourselves, creatures that need a lot of energy to survive. Even in the deep hydrothermal vents on Earth though some micro-organisms only rely on the vents themselves, higher organisms depend on oxygen - but in Europa that's no problem as there probably is abundant oxygen there. So, whether or not there are ETs in the seas of Europa, and there are absolutely no ways of knowing right now, it certainly seems likely to be a very common habitat in our galaxy, and a place where ETs could evolve. If you evolved there, in a deep sea, and especially if you didn't have hands, were a bit like dolphins or some such, you could have an advanced civilization (even perhaps with advanced mathematics), but no technology at all. But even if you had hands, or even if you were like an octopus, quite dextrous, still it might be quite hard to do much even with intelligence and even with some way of manipulating things. Octopus carrying coconut shells around with it as a form of "mobile home" to protect from predators, thought of as a sophisticated example of tool use and foresight in animals - but at least from our perspective, it would seem that an undersea creature, even as dexterous as an octopus, would have severe limitations on what it could do compared with a dry land creature such as ourselves. You wouldn't have for instance fire. You wouldn't see things burn. You would have heat, and lava flows occasionally perhaps. So - ETs living in a deep ocean, they would be aware of extreme heat through their equivalent of lava flow diving, and they could work with the gentler flows, as in the second video, but it would be hard to control it and make use of it, and attempts to do that might be quite hazardous for them. They might use lava flows of course, e.g. to smelt iron, drop rocks into it or whatever, and route it into different places and so on. However, they would not be able to generate fire themselves, at least, not nearly as easily as for humans. So, if there are ETs in Europa - or in other places like that in our galaxy, you can imagine their most advanced technology would probably be quite limited. Probably they are not likely to develop the computer chip or spacecraft or things like that. Maybe even after billions of years, they would never even think of such things. If there are ETs in Europa, of course there is no reason at all for them to be of similar age to us as a civilization, indeed that would be a remarkable coincidence if they did. Is far more likely that they evolved to intelligence and civilization millions of years ago. Whether or not there is some ET civilization in Europa, there may be in other parts of the galaxy, and they may eventually one way or another, either we travel to find them - in case of Europa if we eventually explore it, in a very careful way of course, not to cause any harm to Europa, maybe if there were ETs, a very remote possibility maybe - but they might be our first ET contacts - if there were ETs in Europa. Then, they might have a very different time sense from us. In an environment like that, completely covered in ice, no experience of the sun, totally unaware even that the external universe exists at all, and a steady environment - the floor may be a bit warmer, the ceiling of their world would be ice, for them it might be much more important for memories to be organised spatially rather than according to time. This is just my own idea, an idea I'm throwing out. I haven't seen anyone else suggest it, but it just seems a possibility (of course also possible they have similar time self to ourselves). So if they are able to appreciate music, they might understand pitches organized in a different way from the way we do, not in terms of rhythm, but with some kind of spatial way of organizing them. It's not that they couldn't understand time or the passage of time, at least, that would be rather way out to suppose that any ETs can't understand what time is. The idea is rather they have no direct experience of rhythms, or of duration in time, except for the immediate present. They would be a bit like a human (such as Henry Molasson) who retains short term memory but loses all capacity for long term memory, but of course with the ETs, their memory is not impaired. The idea is that they can remember things fine, according to the norm for their species, just that they organize their memories spatially, '"hook" their memories onto locations in space, e.g. places they visit etc, rather than locations in time such as today, yesterday or whatever. So then it might be easier for them to work with pitches if they are arranged in space, rather than time. In their music, just as with their memories, they might associate pitches with particular locations in space. This is actually a whole idea that has been developed in modern music, of this musical geometry, where musical pitches can be given a location in space, which shows the musical relations between the notes. This is a general thing, you can do it with a wide range of musical systems. But of special interest here perhaps are the constructions which are highly symmetrical, with no tonal centre, and music can be quite static because of that, a kind of weightless, and static effect to it. This might well give us a point of contact with ETs whose appreciation of music has a timeless quality without rhythm or any direct sense of duration beyond the immediate present. I'll talk about it some more in the next article, but for a first taste of this musical geometry, you can try the hexany, one of the "CPS sets", musical geometries, designed by Erv Wilson, which is a musical scale with the pitches at the vertices of an octahedron. 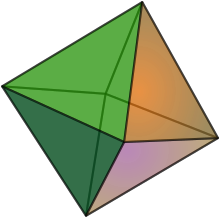 Octahedron. The hexany has notes on the vertices of an octahedron, and perhaps may give us some idea of what music might be like for an ET with a different time sense with sense of time which isn't linear and ordered like ours, or if they have only a weak linear sense of time, and no sense of rhythm. Click to go to my hexany page to play it. These structures have been used a fair bit by modern microtonal composers, notably by Kraig Grady, ambassador of the imaginary island of anaphoria. You can listen to Kraig Grady's composition "A farewell ring" for the Hexany here. David Keenan's "Tumbling Dekany", gives another way you can listen to and try out these musical geometries for yourself - it is a musical Excel spreadsheet, so you need Excel to hear it, but it gives you an idea of another, five dimensional this time, structure of musical pitches. (If the spreadsheet doesn't work, make sure you followed the instructions on the page, e.g. to cancel any error message about circular references and enable macros). A realization of this by George Secor was selected as number 55 in the 2010 60x60 music and choreography Untwelve Mix. For the mathematics behind the hexany, dekany and other "CPS sets", see the Wikipedia article about the hexany here. These "musical geometries" more generally are a standard part of modern microtonal music theory, as "lattice diagrams" and for instance the hexany can also be thought of as one of the components of a 3D musical lattice, alternating hexanies with tetrads in the same structure as the octahedra and tetrahedra lattice (same structure as the greengrocer uses for stacking oranges) - but that is getting a bit far afield here, I may go into it in the next article. For all we know, our Earth linear sense of time that we have might be quite unusual in the galaxy, if most of the ETs live in environments like Europa, we may come across ETs that don't think in a linear time sense way, the way human beings do. This might make communications with them quite difficult. There are one or two interesting science fiction stories about that, about ETs that simply don't think in a linear fashion. it is quite a fun idea to explore, and then you can think about maybe this spatial music might be one of the few ways we can have mutual appreciation of their culture, and them of us. All this is totally speculation of course. We've not met any ETs yet so have no way to know, if they are likely to be very similar to us, or perhaps, so different in their ways of thinking that we might have only a few points of contact. So what does all this say about the original question, would we and ETs be able to communicate using music? In this article I've explored some of the ways that they might perhaps be very different from us in their perception of sound, and looked at ways that such issues could perhaps be solved by translation methods. If that happens, perhaps music might indeed be one of those few points of communication, so long as they have some form of perception, either touch or some other sense, that works similarly to our music, and we can find a way to translate one into the other. Given the variety of human music, there seems at least a good chance we might find something in common. The next question is though, what about the particular theme tune for Close Encounters of a Third Kind. Is it possible that ETs would use a simple pentatonic phrase like that? Would they perceive octaves and musical intervals like us? What kind of rhythms might they use? In my next article on this subject, I plan to look at this through the variety of human music and animal sounds. Though we can't know the full extent of the diversity of ET music, it could surely be at least as diverse as the diversity of human music and animal vocalizations. I think you'll be surprised at what a range of different types of music we have. The music you hear all the time on the radio is limited both in pitch and rhythmically. In terms of pitch, most of it is limited to just 12 notes out of the almost infinite range of possibilities, and it is limited to just a few rhythms, most of it, and rhythms like 4 beats to a measure are very common. Is this something that we would have in common with Extra Terrestrial music, this limitation to 12 notes in the octave, equally spaced (with some variation in intonation of each one) and preference for a few time signatures such as 4/4 for most of our music? They would probably discover twelve equal, and the 4/4 rhythm of course, both are simple ideas from a mathematical point of view - but would they use them for their music? You can look around and there are lots of different ways that pitches and rhythms are organized in human culture, these structures in music that have become so prevalent in the last century or so are just a few of many types of musical structures used world wide. There are also many diverse structures invented and used by modern composers with interest in microtonal music or complex rhythms. Perhaps this variety of human music can tell us something about possibilities for ET music and musical appreciation. And perhaps there are things that are also universal between different musical systems. 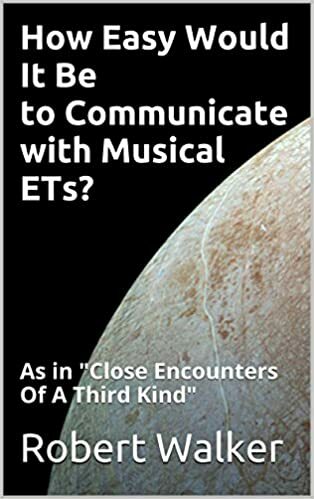 So that's what I'm going to look at in the next article, also to look closely at animal and bird uses of calls and "music" and see if that tells us anything about how ETs and ourselves may be able to communicate through music. (N.B. I never did that article, but still hope to some time). This article developed out of a video on my marsandspace channel on youtube, for the video, see Is Music a good way for humans and ETs to communicate?. I was asked the question 53 minutes into the spaceshow podcast "Humans to Mars and other destinations in the solar system - with Robert Walker". Music And Mathematics Of Fractal-Like Sloth Canon Number Sequences - this was the original reason why I developed Tune Smithy. Why Didn't ETs, Or Self Replicating Machines, Colonize Our Solar System Millions Of Years Ago? Self Replicating Robots - Safer For Galaxy (and Earth) Than Human Colonists - Is This Why ETs Didn't Colonize Earth? What Food Can You Safely Share With An ET? Do you want to download this as an ebook, to read on your kindle, or kindle app (available for most operating systems)?